FISCHER GOLDSCOPE SD 515 The X-ray fluorescence measuring instruments of the GOLDSCOPE SD series are optimized for fast, cost-effective and non-destructive analysis of jewelry, coins and precious metals. Furthermore, the instruments are well suited for determining the thickness of gold coatings on sterling silver and rhodium coatings on gold alloys. 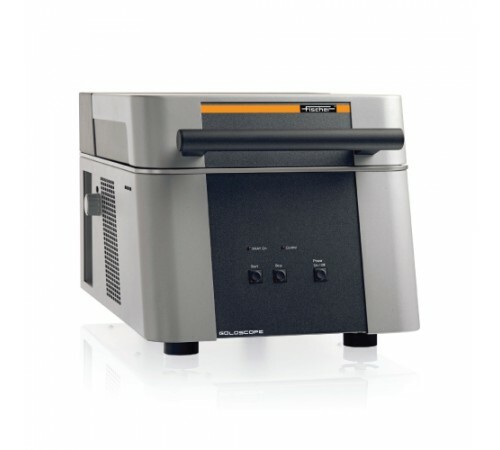 The GOLDSCOPE SD series comprises four different instruments to fulfill the specific demands from the fast purchase and sale of gold up to the high-precision analysis of precious metals. Typical fields of application are the analysis of: • Jewelry, precious metals and dental alloys • Yellow and white gold • Platinum and silver • Rhodium • Alloys and coatings Outstanding accuracy and long-term stability are characteristics of all X-RAY systems from FISCHER. The necessity of recalibration is considerably reduced, saving time and effort. The GOLDSCOPE SD 510 and SD 515 instruments are equipped with a modern silicon PIN detector, which achieves high accuracy and good detection sensitivity. For even higher resolution, the GOLDSCOPE SD 520 and SD 550 instruments with their Silicon Drift Detectors (SDD) are available. The fundamental parameter method by FISCHER allows for the analysis without calibration. Design The GOLDSCOPE SD instruments are designed as user-friendly bench-top instruments. Due to their compact design, the instruments are lightweight and require only little space. The GOLDSCOPE SD 510 offers the smallest footprint, because the measurement chamber door does not open upwards, but towards the front. Thus, you can place a notebook for operation onto the instrument, which saves space. For quick and easy sample positioning, the X-ray source and detector assembly is located in the instrument‘s lower chamber. The measuring direction is from underneath the sample, which is supported by a transparent window. The integrated video-microscope with zoom and crosshairs simplifies sample placement and allows for a precise measuring spot adjustment. The entire operation and evaluation of measurements as well as the clear presentation of measurement data is performed on a PC, using the powerful and user-friendly WinFTM® software.Specification: Model Goldscope SD 515 External dimensions Width x depth x height [mm/in] 403 x 588 x 365/16 x 23.2 x 14.4 Weight [kg/lb] approx. 45/99 X-Ray Source X-ray tube Micro-focus tungsten tube with beryllium window High voltage, three steps [kV] 30, 40, 50 Aperture (Collimator) Ø [mm/mils] Fixed Standard 1,0/39 Option 0.6/24; 1.0/39 or 2.0/79 Smallest measurement spot* Ø [mm/mils] approx. 0.7/28* X-Ray Detection Detector type Silicon PIN detector peltier-cooled Resolution fwhm for Mn-Kα [eV] ≤ 180 Element range S (16) to U (92) Repeatability for gold, measurement time 60 sec ≤ 1 ‰ with aperture 1.0 mm Usable sample placement area [mm/in] 310 x 320/ 12.2 x 12.6 Max. sample height [mm/in] 90/3.5 .. 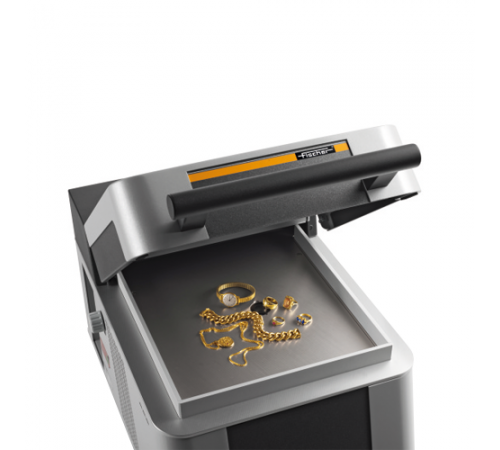 The X-ray fluorescence measuring instruments of the GOLDSCOPE SD series are optimized for fast, cost-effective and non-destructive analysis of jewelry, coins and precious metals. Furthermore, the instruments are well suited for determining the thickness of gold coatings on sterling silver and rhodium coatings on gold alloys. Outstanding accuracy and long-term stability are characteristics of all X-RAY systems from FISCHER. The necessity of recalibration is considerably reduced, saving time and effort. The GOLDSCOPE SD 510 and SD 515 instruments are equipped with a modern silicon PIN detector, which achieves high accuracy and good detection sensitivity. For even higher resolution, the GOLDSCOPE SD 520 and SD 550 instruments with their Silicon Drift Detectors (SDD) are available. The GOLDSCOPE SD instruments are designed as user-friendly bench-top instruments. Due to their compact design, the instruments are lightweight and require only little space. The GOLDSCOPE SD 510 offers the smallest footprint, because the measurement chamber door does not open upwards, but towards the front. Thus, you can place a notebook for operation onto the instrument, which saves space. For quick and easy sample positioning, the X-ray source and detector assembly is located in the instrument‘s lower chamber. The measuring direction is from underneath the sample, which is supported by a transparent window. The entire operation and evaluation of measurements as well as the clear presentation of measurement data is performed on a PC, using the powerful and user-friendly WinFTM® software.